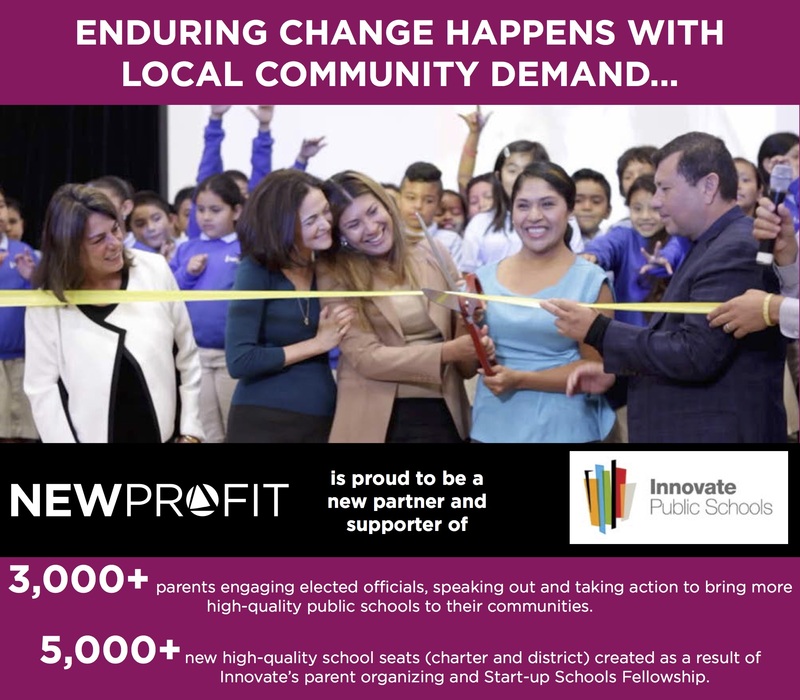 November 19, 2015 (Boston): New Profit, a national nonprofit venture philanthropy fund working to break down the barriers standing between people and opportunity in America, is investing $1 million over the next four years to support Innovate Public Schools (Innovate), a Bay Area-based nonprofit transforming education in low-income communities by supporting parents to become the leaders making change happen in their communities, providing accessible information on the problems and solutions in education, and partnering with districts and charters to create more high-quality schools. The investment in Innovate will be a part of New Profit’s Reimagine School Systems (RSS) Fund, a cross-sector collaboration aimed at significantly and rapidly increasing the number of high-performing schools serving low-income students by transforming the way school systems work and lifting up new models that can be used at scale across the country. Providing parents in high-need communities with leadership training and coaching so that they realize the power of their voices and can become compelling, constructive advocates for better schools, sustaining change in their communities over the long-term. Creating and disseminating easy-to-understand, high-quality data and research to parents and their communities that highlight which schools are excelling and which are underperforming, and what the most effective solutions are to create more excellent public schools for low-income children. Partnering with educators from both school districts and charter schools to start excellent new public schools and redesign chronically low-performing schools through their Start-up Schools Fellowship. Innovate has worked with parents and district leaders across five districts, and is seeking to expand its work into as many as three more districts in the next 2-3 years. Through the new National Parent Leader Institute and the Community Organizer Training Program, Innovate is also developing community organizing and parent leadership trainings to support change efforts in other cities and transfer their expertise more broadly. Innovate’s Start-up School Fellowship plans to work with 10 charter schools and district schools by 2018 to support the creation of over 5,000 more new high-quality school seats. Innovate’s approach and commitment to creating widespread impact make it an excellent fit and partner for New Profit’s RSS Fund, which is focused on (a) creating actionable demand for better schools through changing the policies and politics of education systems, and (b) supporting great school models that can grow the supply of high-quality schools to meet that demand. The funding from New Profit’s Reimagine School Systems Fund will be unrestricted and supplemented by strategic advisory support from New Profit staff in collaboration with Deloitte. Learn more about Innovate Public Schools by visiting www.innovateschools.org.